The Monterey Pine Aphid is a native of North America, its distribution ranges from southern British Columbia in the north to southern Mexico, it eastern range extends to Nebraska, it is also found as far south as Florida in the southeast. It is a recent introduction to Europe and has been identified in both France and Spain; it has also been identified in New Zealand and Southern Brazil. 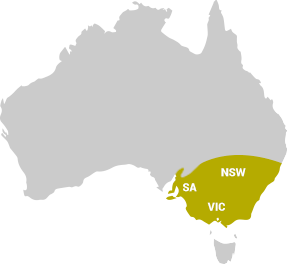 The Monterey Pine Aphid was first recorded in Australia in March 1998 on Pinus Radiata near Canberra; it is now present in all areas across Australia where pine trees are grown. 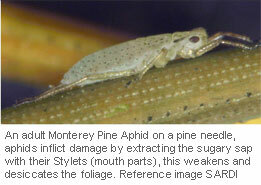 The insect is typical of aphids in its damage to plant tissue, infestations cause browning and the defoliation of pine needles, this weakens the tree. 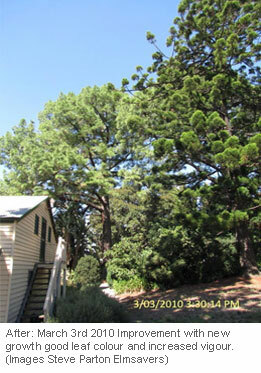 Monterey Pine Aphid infestations are more frequent in drier years; it is also the cause of substantial losses to the plantation industry. 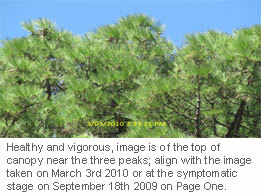 Elmsavers treats this insect pest in susceptible pinus species by tree injection. 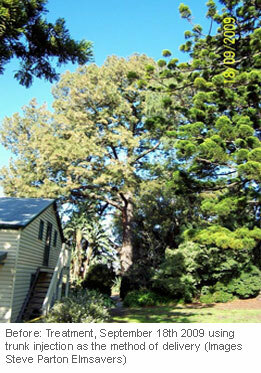 We have treated the Canary Island Pines within the gardens at the Burnley Campus, which is a part of The University Melbourne. Tree injection using Neonicotinyls is the most effective method; it can be undertaken throughout the year offering long term control in resinous coniferous trees.